Police Commissioner Ed Davis has officially become a litmus test in Boston’s mayoral race. Suffolk District Attorney Daniel F. Conley yesterday vowed to keep Boston Police Commissioner Edward F. Davis if elected mayor, as a rift between the two men appears to have ended. “Commissioner Davis and I have had a very close working relationship for many years now. 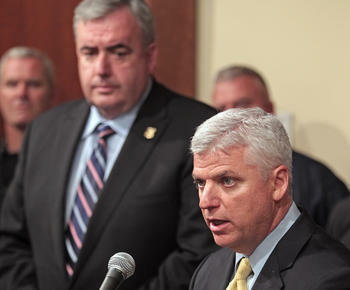 We are in constant communication anytime there are issues involving the public safety in Boston,” Conley told the Herald. In the past, the DA and Davis have clashed over jurisdictional issues and strategies for dealing with Boston’s homicide rate. That triggered this piece in Thursday’s Boston Globe (which credited the Herald for raising the subject) . . .
Read the rest at It’s Good to Live in a Two-Daily Town. This entry was posted in Uncategorized and tagged Bill Walczak, Boston Globe, Boston Herald, Boston Marathon bombings, Boston mayoral race, Boston Police Commissioner Ed Davis, Charles Clemons Jr., Charles Yancey, Charlotte Golar Richie, Dan Conley., David James Wyatt, Felix Arroyo, It's Good to Live in a Two-Daily Town, John Barros, John Connolly, litmus test, Martin Walsh, Michael Ross, Robert Consalvo. Bookmark the permalink.